Hello Lovelies! Thanks for coming by for the nail files! YAY FOR NAILS! This week, I worked with some new goodies that arrived in my mailbox. 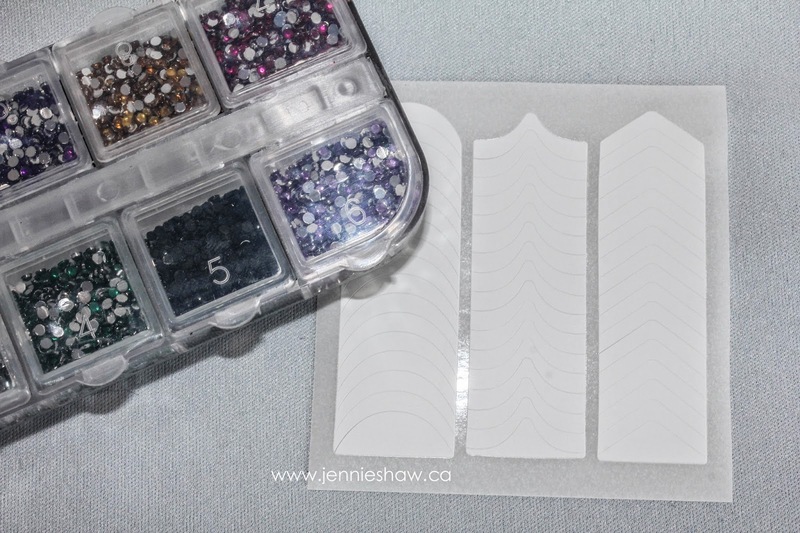 I recently went on an eBay binge and the latest package included three different patterns of nail strips. I decided to try the simple chevrons and although there were some technical issues, they worked out pretty well. Black rhinestones and wide chevron strips. For the bases, there are two coats of the magnificent Lissa (seriously, I can't even talk about this teal) on all fingers but my pointer, which has one coat of Paper Mache. When my ring finger was very dry, I stuck on three simple chevron stickers and smoothed them down as best I could before applying two coats of Paper Mache (to really cover up Lissa, although it pains me to write that because it's the best teal ever, ha). I let that dry for a while and then added a coat of Sea Temptress to it, and my pointer finger. When Sea Temptress was dry, I peeled off the stickers and put on a good layer of top coat. The polish bled a little, but I blame the strips, not the polish. They're just so freaking thick! Why don't nail strip designer people use a different medium? The thickness of the sticker creates a literal wall of polish, so even if you meticulously apply it along the borders, it still collects and takes FOREVER to dry. And when you peel it off, it almost always bleeds!! Why, nail strip designers, WHYYYYYYY? After the strips were, well...stripped, I sealed it all under top coat, and then, when it was dry, applied the black pearls. (Truth time, they're actually rhinestones, but when I covered them with top coat, they lost their reflectiveness and thusly became more pearl-like. Ha!) I put three on my ring finger, and then one on my pointer finger. I've gotta say that Sea Temptress is prettier than I gave it credit for, in the bottle. The pearl shine is lovely and although I'm not totally sure that the small circular glitter pieces create a "mermaid tail" look, it's very pretty nonetheless. And overall, I love how it looks with Lissa (which I'm sure you're shocked about because I've only mentioned it twice in this post that I'm obsessed with the colour, ha!). 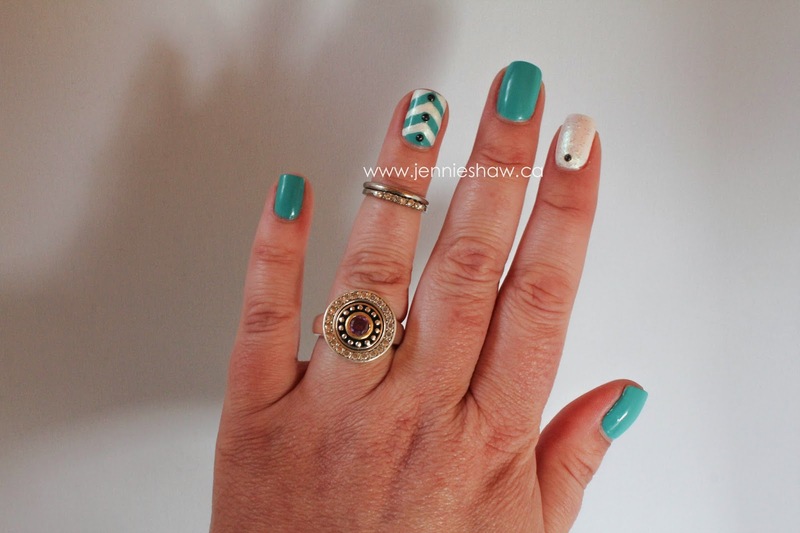 The simple chevron stripes make for a great feature finger, as well. Almost like a fishtail, don't you think? So what are you rocking this week? Link up and show them off! Have an awesome weekend, everyone! FRIEND!!!! Peel the stickers IMMEDIATELY after painting over them! You'll get clean, crisp lines! I know it seems like it would do the opposite, but when the polishes get that "tacky" feel, they end up "pulling" (those little strings?)! I promise you, pull the stickers up immediately after painting and you won't even believe your eyes! But regardless--I LOVE THIS! The colors and your feature fingers! OMG! Amazeballs! I always seem tog et some bleeding too, even when I pull them up immediately. What the heckkkkk. Regardless though, I think your chevs are awesome and the colors you chose are great, as per usuuuual!